Can You Recall The Five Faces You Saw Today? Last Friday, as I was rushing for work and walking into the subway station on East 86th street, I was so lost in my own world and thoughts that I did not see a man coming from the opposite side at the same turnstile where I was about to swipe my card. I noticed that only after swiping my metro card. Not even after swiping, I actually saw that when I had moved turnstile in to enter the station and came in less than an arm’s distance from that man. Now I saw that he was blind and that he was now inching back to make room for me to move forward. I could not feel more shamed of myself, of my absentmindedness. This was so not mindful living. That man began doing without having any eyes, what I could not do, with two perfectly functioning eyes. A woman now assisted him in making the exit. She gave me a look of contempt, which I clearly deserved. These few seconds now were the moments of very high awareness and consciousness for me. I can never forget the faces of that man and the woman who assisted him. Feeling awful about this, I got into thinking about the cloud of our personal thoughts that surrounds us, ALL the time when we walk around in New York City. The things that are allowed to be a part of this cloud are devices – our cell phones, our e-readers, our music players. We don’t really lift our heads up or take our eyes off our devices or books to make an eye contact. Even when neither of the devices are engaging, our thoughts are still elsewhere. We say New York is a melting pot of cultures, but we don’t even know the language of the person sitting next to us in the subway because Spotify is streaming into our ears, screening off any linguistic treat from commuters. From the time we leave our apartment in the morning, till the time we hit the bed in the night, we must be coming across at least 30 new faces ( no Maths done), but can we recall even five of those faces when our head lands on pillow for a good night sleep? There was another face I will never forget. Few days ago, I was taking a cross town bus from west side to east side ( I don’t take buses otherwise ) and the seat to next to me was empty. A noticed a really old woman approaching towards this seat. I just smiled, which I usually do when I see someone coming towards me. Not a big wide grin, but just a moderate smile of acknowledgement. And I resumed reading the Metro News. The woman took seat and said, “Thank you for your smile”. I can’t even forget the tone and warmth of that voice. There are many people of her age who probably didn’t grow up in a time of wired humans. For them, it’s hard to comprehend this new generation that is wired in an individual virtual cloud. So possibly, it was a pleasant surprise for her to receive smiling acknowledgment of her existence from a random stranger. And it was a surprise for me, for I did nothing extraordinarily out of my way to please here, I did what I usually did. I know that it might be too much to ask from urban dwellers to always stay in the present and notice every human they see and make eye contact with everyone. That will be a lot of visual information to process each day. But that done in moderation might make each day a more pleasant one as the researchers Nicholas Epley and and Juliana Schroeder found in their research at University of Chicago, which I still believe is nothing earth shattering. Often, the clouds are full of thoughts about past and present. 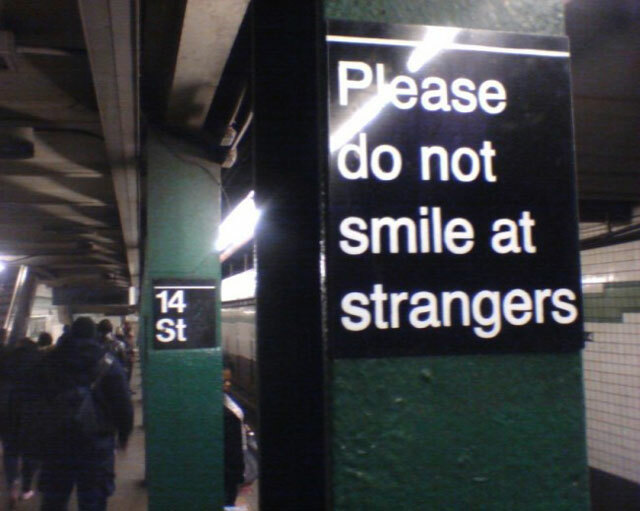 Engaging with strangers help us distract from them and get back in present, at least for time. Looking in other’s eyes and seeing their faces make us more empathetic towards them because we begin to see them as humans and not as objects dotting our way to some destination. Who knows, you might not need to go to Match.com or OkCupid, because the person you were looking for was sitting right next to you on the Q train to Times Square, if only you two had allowed each other in your virtual clouds. So, will you try to recall five faces tonight? From the eyes of an ant. Every day I come to work, but I never observe myself while working. Just imagine an ant sitting in some corner of your cube, and gazing constantly at you every day. Here’s what an ant wrote in her diary about me. This guy with different hairstyle comes everyday to this place. Then he sits silently and keeps banging some keys for most of his day. Sometimes, raises his head, he looks around, put the mouth of a bottle in his mouth, and then resumes staring at the colorful screen in front of him. Of late when I meet some married acquaintance of mine, I am getting a new tag – ‘Uncle’. When ever I visit his/her family, the kids address me as uncle. Or that friend will ask the kid to ‘say hello to uncle’. I remember when Papa’s friend Sanjay ‘uncle’ used to visit us, we would call him uncle only, and he used to be of same age as I am today, and he too was unmarried. In fact, there were lots of Papa’s friends who were uncles for us. So for my married friends, it’s perfectly fine for them to find an uncle in me for their kids. But I fail to find a fixed point in time line when I made this transition from ‘Bhaiyya’ to ‘Uncle’. Or was it rather a gradual transition? Whatever it may be, it hurts to feel I have aged. A ‘Chaachu’ might have felt pleasant and less age defining! But then it would have become a formal relationship in Indian set up, whereas ‘Uncle’ is a freeway relationship, you get in and get out as and when convenient! We often start liking someone or something too much. But sometimes we go so far in liking that we start getting bored of it. It’s like too much of sugar in pudding is also distasteful. I used to like Rajbhog a lot. Every time I go out for eating, I would invariably have Rajbhog as sweet dish or in dessert. But now I feel sick of it. Mere sight of it pushes me towards throwing up. Similar experiences with couple of other things and people make me wonder, in the process of cuddling something, when do we realize the point beyond which our affection for that thing takes a downward curve? I have been listening to Raag Tilak Kamod a lot. I listend to all its versions I could find online – instrumental – shehnai, sarod, sitar; vocals – by many different artisits; and even film songs which were purely in this raag. When I get up after a nap, often the first words are the lyrics of this lovely song, ‘neer bharan kaise jaaon’ in raag tilak kamod. Now I have started having fear if I should stop liking it so much lest I should grow dislike for this beautiful music too? Does that love hate relationship hold true for music too? Can we possibly stop liking something ourselves voluntarily? Is there an on/off button for it? And if not, what about the pain when the other party in the liking process becomes unavailable or start disliking me? What if I love chicken and there’s a bird flu? What if I am madly in love with someone, but she magically finds out that button to stop liking me? PS: kehet Ravi Jain suno bhai saadhu.. at least in a relationship (including friendship), if we manage to come out of that downward curve once.. then begins a never ending upward curve of eternally blissful relationship. There is such a big variety of kids one can see in a kindergarten that the enormity of diversity of human race is quite understandable. When in the tender age of 3-4, these kids are so much different from each other; we can very well imagine the difference in every aspect of these kids when they grow up into adults. Today lazily I was observing the kids in my mom’s kindergarten. There is one boy who is lost in his own world. Perhaps that explains why some people are introvert and prefer solitude or are not bothered by what’s happenings around. Of course, as kids grow, lots of transitions takes place in their physical and mental behavior. This small kid might as well become a rock star at 18! I also saw many kids who had formed a group. In the group, one would behave like a leader, will initiate talks, will explain things to group mates like some seasoned manager. Group members would sometime hit the leader, and sometimes some other kid will take up the leadership role. We can also see some kids sitting in pair and fighting with each other non-stop. There are some kids who sit observing others. They look like spellbound by what other kids are doing. Such fascination is clearly visible in their eyes which are wide open in fascination of what other kids are doing. And yet, all these kids are so much different from one another. Each kid is unique in one way or the other. I was struggling hard to reach Noida for the first time through this new route (yes, I did cross check it pronunciation on wordweb just now. And it did not sound as absurd in the American voice of wordweb as it bleeds when people in my office make pronunciation ) to India Gate. Here we had this sardar ji who was driving auto-rickshaw next to me. I was pissed off with heat of the day and frustration and fatigue of biking, and already I had sun burn so far. I asked this auto guy the way to nizamuddin bridge. He was very considerate and explained me the way with great patience. There was huge traffic jam and we had enough time to for a small conversation. Sardar Ji too needed someone as much as I did to distract oneself away from the frustration of traffic, heat and driving. He said,”sardar ji uranium manga rahe hein desh ki bhalai ke liye”. I was amazed at his interest and knowledge about country’s problems and politics and his flair for technological-infrastructure projects. He told that coal will not be able to solve the country’s problem of power. He pointed to the thermal power plant near Pragati Maidan and asked how long and how many people that could serve. Another lovely thing of this little chat was his addressing Prime Minister Manmohan Singh as ‘sardar ji’!